And so now...I have my very own shop! With a door and a key. Well, not quite yet...but soon! Sometimes things change quickly. Less than a year ago I set up my own business and started promoting my ventures online. In January I set up an Etsy account, in May I started selling at Yeadon's bookshop in Elgin and I've done a number of craft/vintage fairs since last Christmas. 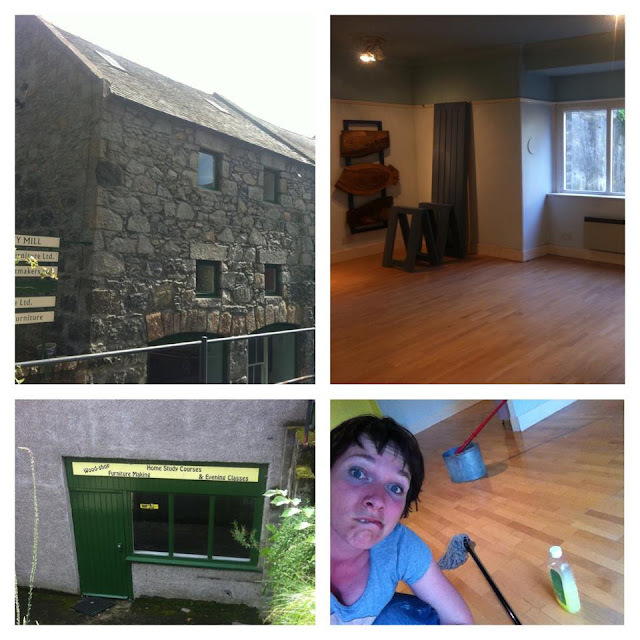 It is August now and I have just got the keys to my very own studio & shop space. Eeek! What's going on?! Am I scared? Yes, I am! It is totally out in the sticks and not on a busy high street, so yes, I do wonder whether people are actually going to find me!! Nevertheless, it is hugely exciting and I will be part of a lovely old building housing other creative people who make furniture - and even complete handmade kitchens (the woodworking workshops there would make any joiner drool!). It will be my own little work space where I can let my creative juices flow, paint, sew, design, make and also show off and sell my furniture, vintage and handmade homeware and other nice things. I hope to make it a fun, inspiring and welcoming place to be, where people can come and spend some time, find inspiration, join me in creating things - or just catch up over a cup of coffee.